1987 ALFA ROMEO 2000inj GRADUATE LTD EDT SPYDER (left hand drive)Very few cars beat the superb styling of Pininfarinas famous Italian cars and this one is definitely no exception. It is stunningly finished in Avorio Alfa Cream with full tan leather trim complemented by a black double duck hood which is as good as new. There have been only 3 owners from new, first was Alfonso Caporaso, 2nd was Charles Trapp and the 3rd was Gillian Goodwin who owned car for the last 22 years. The mileage of 47000 miles is warranted and supported by old MoTs, bills and servicing history. This Alfa is fitted with its original two litre twin overhead cam Alfa engine with a 5 speed gear box and is capable of 120mph and 0 to 60 in 9 seconds, astonishing for its day. These cars were only made in left hand drive, so this is a great opportunity to drive a fabulous car on continental holidays or to keep at a holiday home abroad or enjoy on the UK roads. However, if you feel the need for a right hand drive Alfa, for a relatively small amount of money this car can be converted to RHD.The history folder includes current and previous V5s, current and previous MoT certificates, MoT related paperwork, DVLA paperwork, insurance paperwork, original Handbook, service book and Alfa Europe map of Dealers book, business cards, write ups, Covercraft paperwork, Sony radio cassette manual, booklet and warranty leaflet, previous bills of sale and previous invoices circa £9000 spent on servicing and general upkeep. In addition, there is a wonderful cassette tape featuring music from OK Italia by Edorado Bennato just to get you in the mood when driving this wonderful sports car.Features include Sony radio cassette music system with electric aerial, overmats, tinted glass, chrome kit, chrome door handles inside and out, toolkit, door mirrors, reversing lights, centre console, leather adjustable seats with headrests, 15 inch wheels with chrome Alfa embossed centre caps, chrome tailpipe, Alfa embossed door mirrors, Alfa cloverleaf wing badges and other Alfa badges, hood cover, rear spoiler, sports steering wheel and locking petrol cap.This type of Alfa Romeo was made famous by the movie The Graduate and has since been a real favourite worldwide. 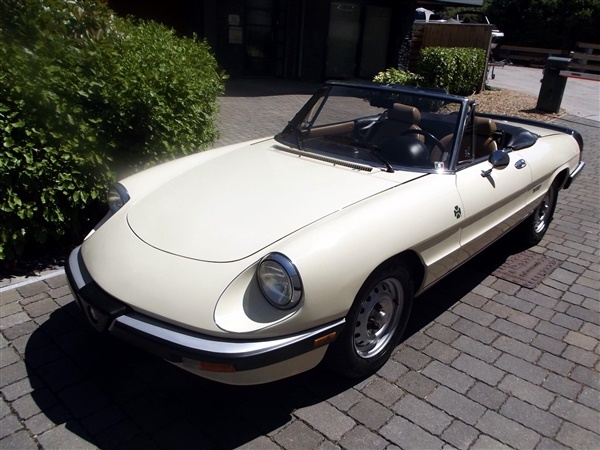 This advert is for an Alfa Romeo Spider, click Alfa Romeo Spider in Poole to see more cars like this in the local area.